Holmenkollen, March 23 (TASR) – Slovak biathlete Anastasia Kuzmina, a three-time Olympic champion, topped the women’s 10km pursuit race at the World Cup finals in Holmenkollen, Norway on Saturday. Kuzmina, who dominated throughout the race, was the only woman without any miss in the shooting part, and crossed the finish line a massive 1 minute and 42.8 seconds ahead of Germany’s Denise Hermann and 2 minutes and 1.1 seconds before Sweden’s Hanna Oeberg. „My great shooting dream has come true. I confirmed here that I also can shoot and hit the mark; I finally made four beautiful zeros … I can now calmly and happily finish my career without feeling sad for not having achieved something. I’ll also attempt to concentrate on the mass start race on Sunday, but I can state now that I’ve already seen all my sports dreams come true,“ said Kuzmina cheerfully. Kuzmina, 34, a recent sprint world champion and three-times World Cup champion in individual disciplines, announced that she’d finish her career on Sunday at Holmenkollen. 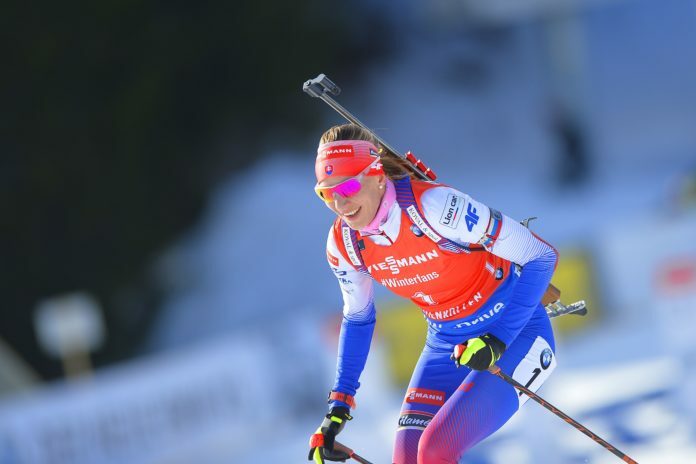 Another Slovak in the race on Saturday, Paulina Fialkova, who started from the third position complaining about sore throat, finished 35th, as she had to go eight penal rounds for two misses in each of the four shooting sections.